Add garlic and ginger and fry until fragrant. Dish up and leave to cool. Steam pumpkin until cooked, then mash and combine well with seasonings into paste. Shell prawns and remove veins and pat dry. Coat with pumpkin paste. Heat oil and deep fry prawns. Leave some oil in the pan and fry 1 1/2 tbsp golden salted egg yolk briefly over low heat. Stir in the fried prawns and briskly combine well. The pumpkin paste gives the prawns a bright golden color and makes the dish more nutritious as pumpkin has a high content of beta-carotene. Make sure that the oil temperature isn’t too high to avoid burning the pumpkin batter. Hi Ann, I cooked this dish tonite. I think I may have done something not right. All the pumpkin paste did not stay on the prawns once I put them into the oil to deep fry. So my prawns only tasted of the salted egg and nothing of the pumpkin. In fact, there are pumpkin bits floating in the oil. 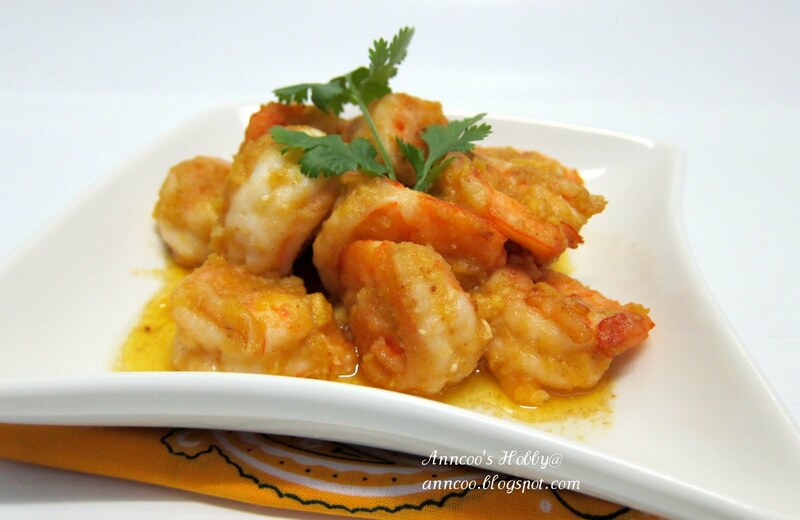 Can you tell me how did you coat the prawns with the pumpkin paste? What did I do wrong? Thanks for your help! Thanks Mimi for your compliment. I always learn something new here. This looks delicious. Madin: Thank you much for your sweet comment. Yes, we have salted chicken egg here too but I still prefer the salted duck egg. Kristen: Oh Kristin! It is really sweet of you to pass me this Award. Thank you very much and I'm really glad that you like my blog. I love your blog too, you have great recipes that I always like to read. Thank you! Happy Dumpling Festival, in fact I completely forgotten today is the day..hahaa..
Claudia: Thank you very much for your compliments. I do have to admit that some of these interesting ingredients are somewhat foreign to me. You however got me curious…hence, I'll have to look into to it. I do know one thing…it looks absolutely delicious!!! Prawns, my favourite, my favourite!!! This is my favourite too…I often add some curry leaves to it too. Anncoo..this is so delicious that drooling at it can't stop the salivating so looks like I have to cook it to satisfy my craving and stop the salivating. Thanks for sharing the recipe. Great one ! I know that I am posting twice but I just wanted to let you know that I nominated you for a Beautiful Blogger award because I love your blog. Your pictures always make me so hungry! The information and award are on my page. I love salted duck eggs. Unfortunately it's hard to find them here. What they sell in Asian Market are salted chicken eggs, and it is not the same. I always love your recipes Ann. Thank you for making me drool on the shrimp with the salted yolks. Indonesia-Eats: Thank you for your comments and the info of alcohol. Oh Lia, welcome back. I actually thought you're away for vacation. Angie: The salted egg really enhanced the whole dish of prawns. Wiffy, Ann: Thanks for your compliments. This dish is just wonderful, like salted egg but need to watch my cholesterol level! This sounds fabulous! Very intriguing with the golden salted egg yolk! I've never tried this before. I'm sure I will like it. This look exactly like those serve in restaurant, well done! Sarah, Kristen: Thanks for your comments. Thanks Rebecca for your nice comment. Gert: The plain flour is in the seasonings. Maybe can dip the prawns in egg white then the seasonings. Peachkins: So how do you cook with the salted eggs? Juliana, Velva, Chris: Thank you for your compliments. I love this! So rich and flavourful! A truly rich seafood dish and I am sure this tastes heavenly! Look like the one in the restaurant, must be very yummy. the pumpkin paste will add more flavor to the prawns.. yes, i love pumpkin too.. salted egg is also my favorite..
i love this dish! Yummy! The other day my colleague just mentioned this dish to me which sold in the coffee shop near her house. I only tried the crab version before, I am sure this prawn version is yum yum too. wow, wow looks from tempting leh…. Oh my! I love salted eggs by themeselves… this is amazing! Wow, I like this dish a lot. I wonder if the pumpkin will be able to coat the prawns properly when you fried it because no flour being use? OIC, when dine out can read from the menu on golden sand prawns and crabs. Ann, this looks superb. Salted egg yolk is always so fragrant and gives amazing flavours when fried with almost anything… however need to be careful of the cholesterol overkill…. Anncoo, this dish looks wonderful! Anncoo..This dish looks very inviting..This preparation is new to me. Love that you have used pumpkin paste ..and made it even more healthier.. This is so elegant looking! I will have to give this a try. Von: There is also popular dish~golden sand crab~have you tried before? Right I think this is quite unhealthy, cannot cook often ;( I really don't know what to do with the egg whites, threw way. Thanks Quinn, I think the egg yolk was quite sandy maybe add a little cream without pumpkin, also not bad~ like the popular dish golden sand crab. I actually don't like pumpkin Ann. Any substitute??? Oh my gosh!!!! I super love this one!!! Must make enough just for myself because silly Aaron hates prawn!